NDF flight simulators have become increasingly higher in fidelity in the past decades, and their role in the initial and continuation training of pilots has increased as well. Cockpit Simulators are expensive investments and are operated as much as possible during their long lifetime. The displays in the cockpit need to accurately represent the real aircraft and have high requirements on lifetime. Including real flight hardware in a simulator is costly, so there is a trend towards the use of simulated hardware with lower costs and sufficient fidelity. In a relatively new market area for NDF, we provide affordable “build to spec” LCD display solutions since 2014, which satisfy lifetime and fidelity requirements. NDF has access to world class LCD glass cutting technology, which enables NDF to provide tailor-made LCD displays in avionics sizes and aspect ratio’s which are usually not standard available in the mass LCD markets. With the NDF ARPHOS® backlight technology installed, lumen depreciation and color shift over lifetime are lower than with white LED based backlights. The aviation sector is rapidly growing. Current estimates predict a duplication of the number of airplanes in the coming 25 years! This automatically means that more and more pilots need to be trained and educated, which will result in an increasing demand for simulators. We can offer simulator displays of Boeing 737 and Airbus 320 (also available for Full Motion). ‘Build to spec’ LCD display solutions. Identical appearance to actual aircraft. 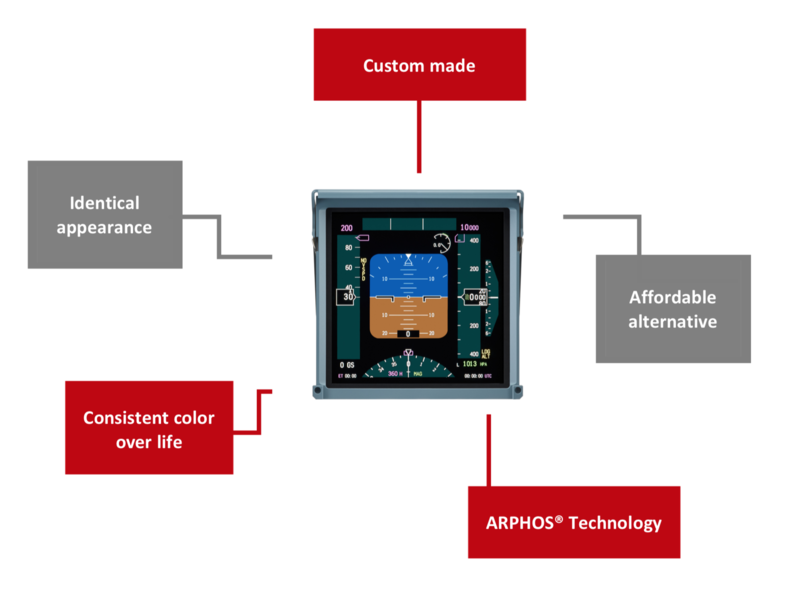 Tailor made to LCD displays in avionics sizes and aspect ratio’s (not standard available in avionics market!). The NDF advanced backlight technology is based o color conversion by remote phosphor. ARPHOS® uses a blue-pump LED as a basic light source. The advantage of this very stable blue LED is, that its wavelength can be converted to visible light in almost every color that you wish – we are able to customize the color to your specific needs.